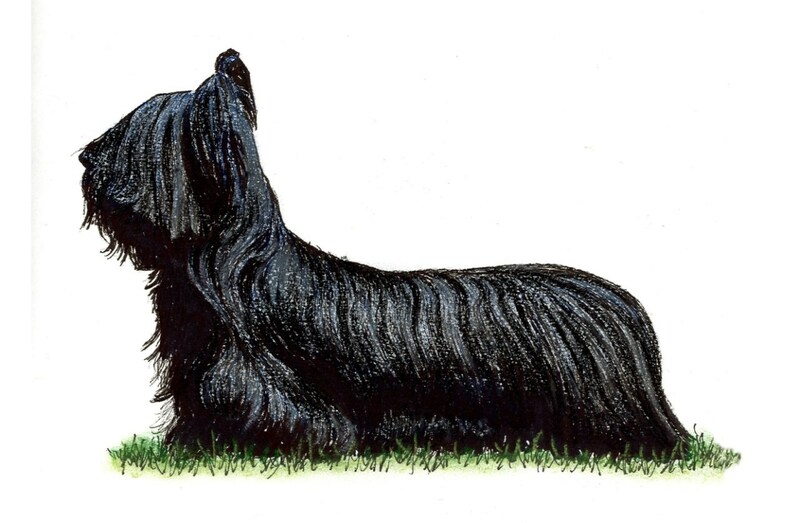 : One of the oldest Scottish breeds; The Skye was once known as the Terrier of the Western Isles, evolving into what we now call the Skye Terrier, with a mix of breeds behind him, including Cairn Terrier prototypes. One of the most famed of the breed was Greyfriars Bobby who, in Edinburgh, around 1858 took up a vigil at his master’s grave in Greyfriars Churchyard until he too died. Greyfriars Bobby was buried in un-consecrated ground in the churchyard and his devotion is commemorated by a memorial plaque in the street and by a tablet on his grave. Although the majority of Skye Terriers are prick-eared, there is also a variety known as ‘drop-eared’, and then the ears hang flat against the skull. : Long; twice as long as high, with coat of good length, Moves with seemingly effortless gait. Strong in quarters, body and jaw. : Body long, low, twice as long as high. : Elegant and dignified. A ‘one-man’ dog, distrustful of strangers, never vicious. : Long and powerful, strength not sacrificed for extreme length. : Of moderate width at the back of skull, tapering gradually to strong muzzle. : Jaws strong and level with perfect, regular scissor bite, i. e. upper teeth closely overlapping the lower teeth and set square to the jaws. : Long and low. Sides appear flattish due to straight falling coat. : Deep; ribcage oval, deep and long. : When hanging, upper part pendulous and lower half thrown back in a curve. When raised, a prolongation of incline of back, not rising higher nor curling up. Gracefully feathered. : Broad, close to body. : Legs short and muscular. : Hind feet smaller than forefeet, pointing truly forward. Pads thick, nails strong. : Strong, full, well developed and well angulated. : Double. Undercoat short, close, soft and woolly. Outer coat of reasonable length, hard, straight, flat and free from curl, never impeding action. Hair on head shorter, softer, veiling forehead and eyes, but not obscuring vision. Mingling with side locks, surrounding ears like a fringe and allowing their shape to appear. : Black, dark or light grey, fawn, cream, all with black points. Any self colour allowing shading of same colour and lighter undercoat, so long as nose and ears are black. A small white spot on chest permissible. : 25 - 26 cms, length from tip of nose to tip of tail 105 cms. Females slightly smaller in same proportions.